I'm brand new to the world of electronics and not very talented, so have mercy. I was wondering if I could connect the input pin of an Arduino (or Adruino programmed AVR microcontroller) instead, to count +1 if the beam is broken by a person passing. Possibly with a delay() function of sorts, to keep it from counting up more than once. EDIT: Apologies for not being accurate on power supply. Unlike this scheme indicates, I used a 9V battery and a 7805 voltage regulator to get 5V on this circuit. Meaning, I believe it would pair well with an ATtiny, programmed via Arduino, that can take 5v as well. The end goal, to complete the story, is to do this with two IR beams, physically a bit apart, their receivers connected to two pins of an AVR microcontroller. The pins register the time stamp of breaking the beam. By comparing the two, we can determine the direction. Going into the room counts +1, going out - 1. Finally the AVR checks if the sum is larger than 0. If yes, someone is in the room and it lights a red LED. 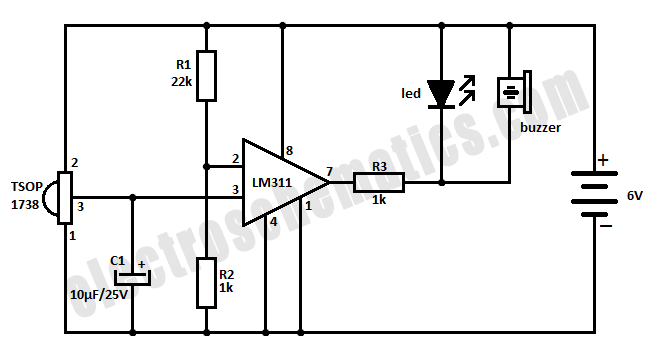 The LM311 in your schematic is configured as a open collector output. It will sink current but not source it. This actually makes it very easy to communicate with a system that runs on a different voltage. You can omit R1 if you enable the pull-up resistor on the input in software. Both circuits could probably be ran off a single 5V power supply if this suits your needs better. I'd recommend adding a 100nF decoupling capacitor on the LM311's power pins, as close as possible to the IC. And perhaps another 100nF capacitor on the TSOP1738's power pins as it is actually a complex IC, not a simple detector. 10K resistor from pin 7 to 6 V.
Diode (1N4004, 1N4148, etc.) from pin 7 to uC input. Anode to pin 7. 100K resistor from uC input to GND. Why do we need hardware programmers? Is my moisture sensor (YL-69) broken?